Why spend your holiday at our place? Are you looking for a unique get away place to relax, recharge and find your balance? Roubenky pod oborou, Stylish log Cabins with a romantic ambience that has all the comforts of home, offers the perfect combination of tranquility and comfort, with 4 charming apartments nestled in a secluded pristine nature surrounded by pastures and forests, just a 8 minute drive from Velke Losiny and Kouty. Amenities include kitchens, fireplaces , TV , Internet, outside terrace and saunal. On site parking, playground and outdoor fire pit. Nature trails, tennis, biking, skiing and swimming nearby. 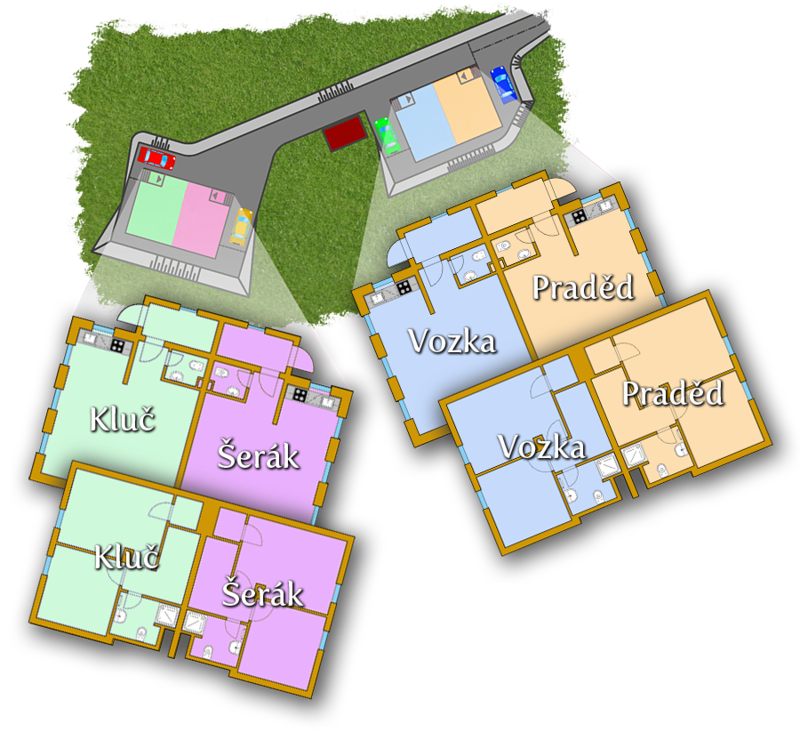 Each log-cabin is divided into two apartments with its own entrances and parking area. Very cozy inside with its own cast iron enclosed fireplace and spacious living room that connects to the kitchen and dining area.Two lovely upper floor bedrooms, two toilets and one bathroom. Facilities include private garden, children playground and sauna and free Wifi. Perfect spot for skiing, biking, hiking, game watching and close to the attractions in the Loucna nad Desnou area. Summer Family Holidays in Jeseníky..